We slept soundly in our mansion-tent-for-three perched atop Half Moon Pass despite windy and snowy conditions. After spending a night in a tent in a storm, it’s always exciting to take that first peek outside in the morning. We woke up at 4 o’clock to find that the windy-snowy part of things had settled down, leaving behind a slightly ominous-looking grey sky. 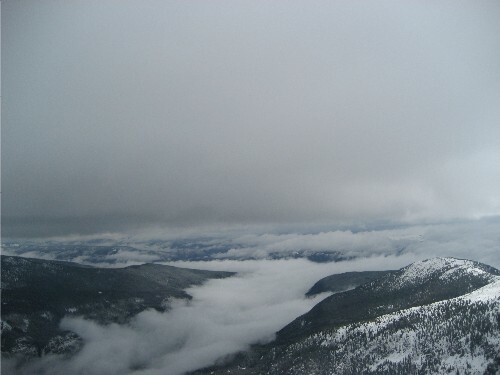 Clouds hovered over the terrain we covered the previous day, giving us that literal above-the-clouds sensation. Love it. By the time we psyched ourselves up on cups of tea and dug our skis out of the snowdrifts, the sky looked much more inviting with its lavender light and (possibly?) clouds clearing. Mount of the Holy Cross? Onward, ho! 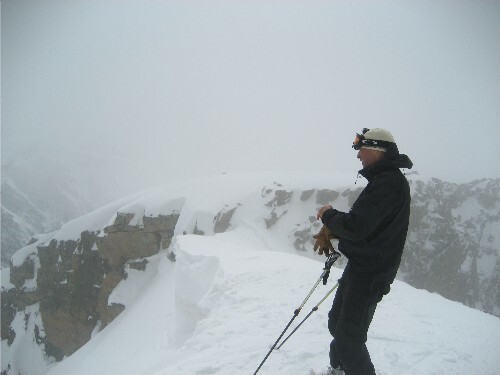 The ski descent down Half Moon Pass proved to be the most technical part of the day, as we decided not to ski the Cross Couloir once we reached the peak’s summit (see last post). This 1,000-foot drop was rocky and cliffed in sections until we finally bottomed-out at East Cross Creek. From there, we had a 3,000-plus-foot climb to summit Mount of the Holy Cross. …or suddenly become sunny. Sometime on our ski descent down the regular Mount of the Holy Cross North Ridge route, the sun started peeking through. By the time we got back down to the creek, we were shedding layers. The big blue sky broke open, and we had a beautiful view of Holy Cross as we stomped back up Half Moon Pass and then skied home. About a week and a half ago, I headed up Minturn, Colorado’s Tigiwon Road with two fit lads to ski the Cross Couloir on the 14,005-ft Mount of the Holy Cross. 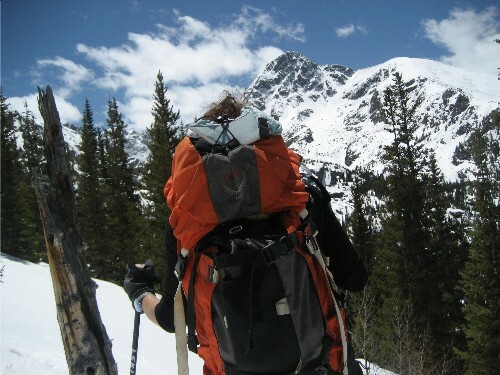 This undertaking would prove to be no ordinary backcountry adventure. Since it snowed so much this spring, Tigiwon Road was still closed. 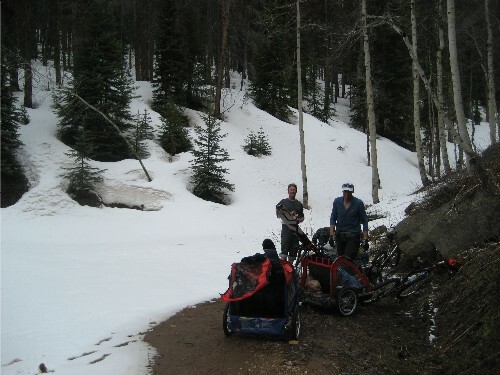 But—no worries—we decided to mountain bike up the jeep road as far as we could get, pulling our skis and camping gear in kids trailers that we borrowed from friends. Then, we stashed the bikes and trailers, skinned up to the top of Half Moon Pass and camped out for the night; woke up in the morning, hiked to the top of Holy Cross, skied all the way back to the bikes. Rode bikes back to the cars. Sort of a wacky idea, no? 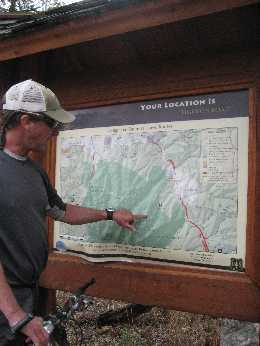 But not entirely original—I first read about this approach on Chris Davenport’s Ski the Fourteeners website’s Mt. of the Holy Cross post. And the idea stuck for me. 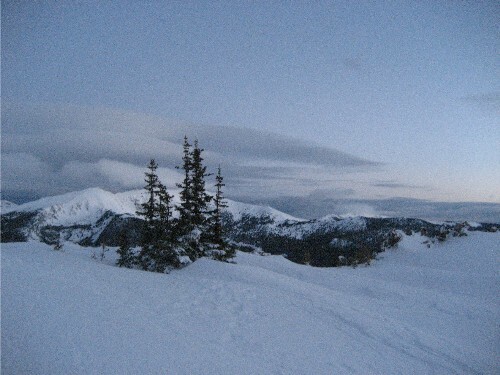 This is the peak I always gawk at in the mornings when I skin up from the valley to Eagle’s Nest on Vail Mountain. 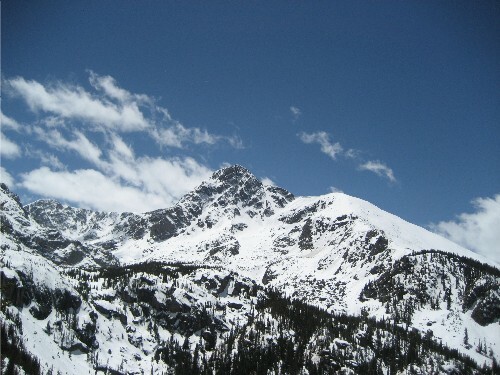 It’s the peak that has grown on me since I’ve lived in Vail, the one I look at and think: I want to ski that someday. So I did. We did. I’ve never pulled gear like this behind a bike, but it was fun. The weather report called for rain, so we all wore waterproof jackets and pants. 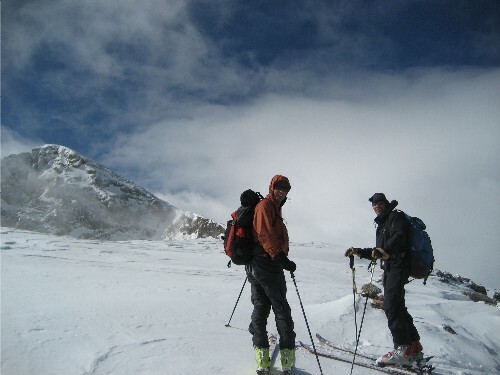 Somehow, we avoided the expected deluge and arrived at the abrupt dirt-to-snow transition, dry and ready to ski. We skinned the rest of that afternoon and set up a camp at the high point of Half Moon Pass, just in time to shelter from the storm. 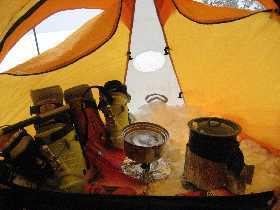 All warm and cozy, we cooked a big dinner while the wind whipped at our tent and snow piled up in drifts outside the door. After a sound sleep, we woke up at four o’clock to find that the clouds were clearing: good to go. Due to the sketcky conditions the storm left behind, we decided to skin up the ridge and check out the Cross Couloir from the summit. Billy and Rich were flying (as usual), moving along at a strong pace with ease. Even though I was the one carrying a harness for the occasion, I gladly adjusted the leg loops to fit Rich, who got delegated the job as the day’s ski cutter. Billy and I belayed. 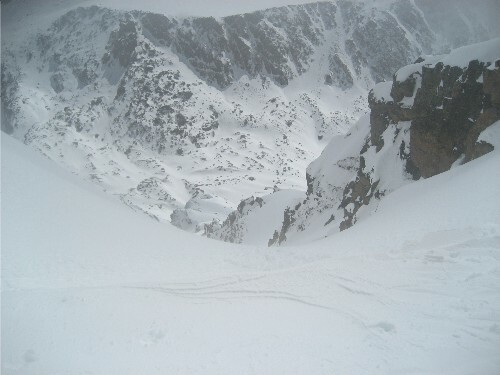 Nothing big bombed off, but we all agreed that the storm had left the couloir unstable. Sketch. 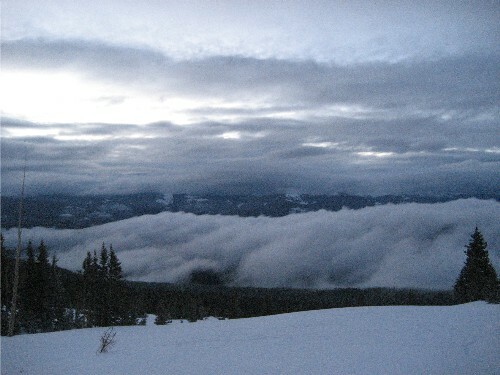 The wind scoured the ridge all night and deposited the snow where we were hoping to ski. None of us felt particularly good about skiing the Cross Couloir in that condition, so we chose to ski back down the ridge instead. Getting out basically took all day, and it hurt. Once we got back to the camp, we were tired and still had to ski down some challenging terrain with heavy packs in mashed-potato snow. Then skin-ski-skin-ski back to the bikes. I was so psyched to throw all of my gear in the trailer and coast down to the car, where we laughed about our blisters and battle wounds, warmed ourselves in the late-afternoon sun.